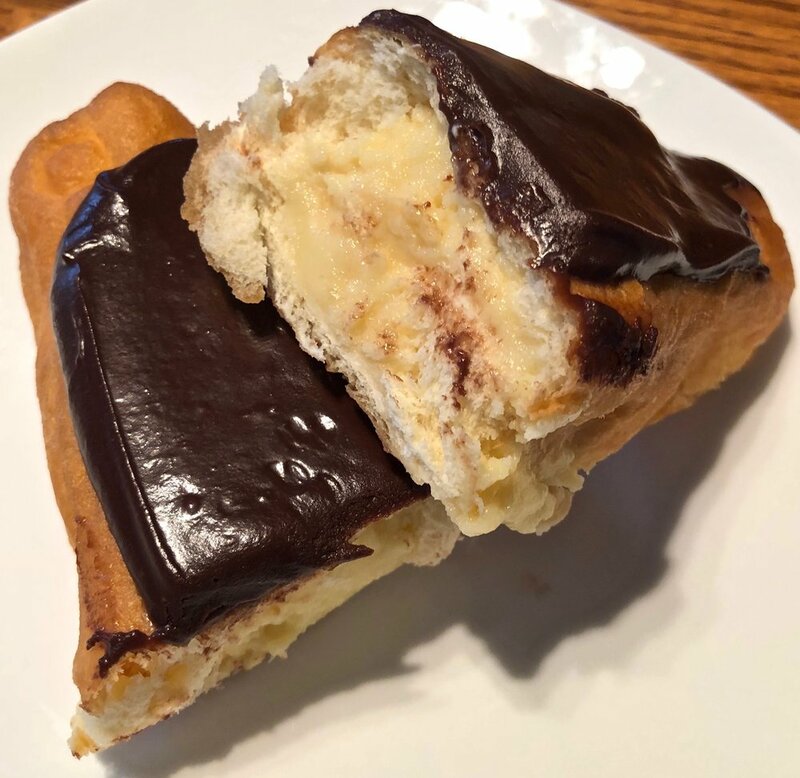 Golden Brown Bakery, forget the cookies, it's the eclairs! Aug 2 Golden Brown Bakery, forget the cookies, it's the eclairs! So yeah, I'm still harping on South Haven Michigan people and you will just need to get over it because there is a bakery on every corner! Okay, not really, but there were a couple and I couldn't stop the car fast enough to give them a try. It is what I do. 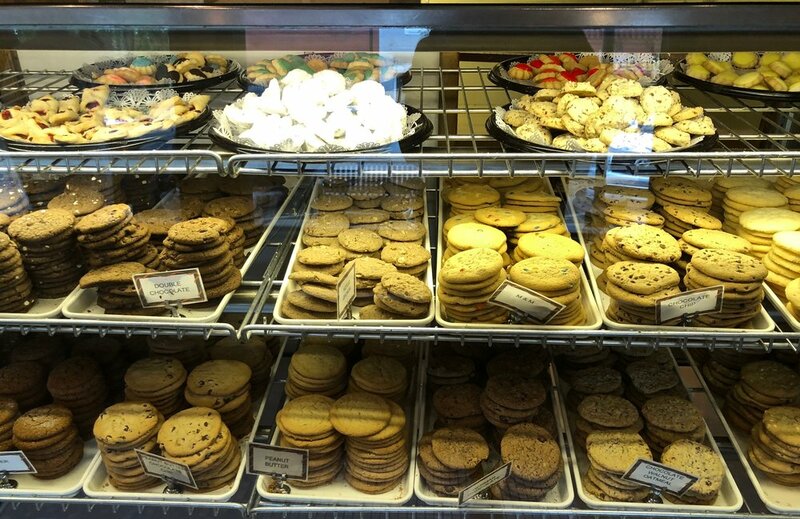 I mean, what is more appropriate for a touristy beach like town on a the shores of Lake Michigan than having bakeries to satisfy everyone's sweet tooth. When you are on vacation the diet goes out the door and you just want to eat whatever you like without guilt or judgement. And in case you couldn't tell, that is what I have been doing during the SO's family reunion vacay. Of course, I'm only covering the food and not all the wine. Lots and lots and lots of wine. But it is daylight and my focus is on baked goods like the ones at Bunde's Bakery Cafe. Seems it has been around for like years or something serving up baked goods and coffee. Evidently this is a popular spot for stuff like cinnamon rolls (but with sugar icing), scones (not totally into those), danishes with fruit (eh) and coffee cake, okay sure why not. This is the decision I came to after looking at their limited case. The coffee cake comes in slice, half and full. I still have full day of eating and settle on the slice. To be honest, I think I really settled on the coffee cake because I wanted to try something but everything looked kind of boring. All basic bread and standard powdered sugar icing. I have to admit, it all looked kind of grocery store bakery to me and I was a little underwhelmed. Though you know I will still eat something! For $2.50 the slice was kind of small, even by Midwest standards. I'm guessing this was 3x2 in size. That's inches and not much else, except maybe the two pecans. Yes, it was a small bite, more like two. Kind of dry (probably to get folks to buy coffee), needed more cinnamon, not enough icing, not as buttery as I thought it would be. Just a lot of nots going on here for me. I think Entenmann's is what came to my mind. Not bad per se but I think the sugar content in Entenmann's is probably higher. I guess this means it wasn't exactly something that excited my taste buds. Plus it was a small piece for the price, even by SF measures. Fortunately, the day had more to offer me for a sugar rush. Like a super old school bakery called Golden Brown Bakery. By old, I mean been around since 1938 with an interior that doesn't look like it has changed much since then. Lots of orange vinyl and wood paneling. Not to mention very dark and low ceilings, but it is the case of baked goods I'm more interested in. Sure, cookies galore, of which you can get a dozen for like $7.99 and an additional dozen for a penny more, or something like that. Yet what really grabbed my attention were the eclairs. Deep fried dough topped with chocolate icing and stuffed with cream filling for only $2 each?! I'll take four! Or to be more precise, I got two with custard filling and two with a buttercream filling. Did I need two of each, no, but I figured I could share with others. I had one and everyone else can just split up the second one. First up was the buttercream and there was plenty of it inside which was the best part of the whole eclair. As you can see it wasn't the airy puffy type pastry dough you normally see but more bread like. It did kind of give more of the heft I like in desserts and at least it was baked through and not mushy or sticky, more pillowy. The icing on top was sticky, sort of a chocolate paste as opposed to frosting, but it all sort worked, or at least tasted right up my alley at that moment. The custard version I was not as enamored of, even though they were free flowing with the custard much like the buttercream. But it was a tad on the too thick and goopy side. Not terrible by any means, but after having the buttercream first, it was hard to be a total fan of this one. But I was okay since I had a full buttercream eclair to nosh and enjoy. She didn't just add some, she slathered it on in droves! I gladly plopped down my $4 for what was a giant cinnamon roll and a bucket of cream cheese frosting. How's that for some airport pricing! I decided to wait and enjoy it on the four plus hour plane ride back. Was it a good? Eh, with enough frosting, it was damn well good enough. Probably could have used a little heating up but you know, airplane. I was able to get quite the glob of frosting in every bite which is why I'm giving the lady and her generous helping of frosting all the stars they want. This might not be your idea of dessert but it definitely hit the spot for me. And there you have it, my adventures in baked goods. Sure, it was the SO's family reunion but I enjoyed all there was to offer and able to cap it all off with all that frosting. I think I'm still having dreams of that cinnamon roll since sadly, Safeway doesn't offer one up for me anymore. I may not have been a fan of the heat, bugs and sand but I'll always have the buttercream and frosting memories. And the wine, lots and lots of wine.